You’ll find versions of Smoked Sausage and Cabbage Soup all over the Midwest, and just about everywhere immigrants from Germany, Hungary, Poland and Czechoslovakia settled. Every family, it seems, has their own little special touches. 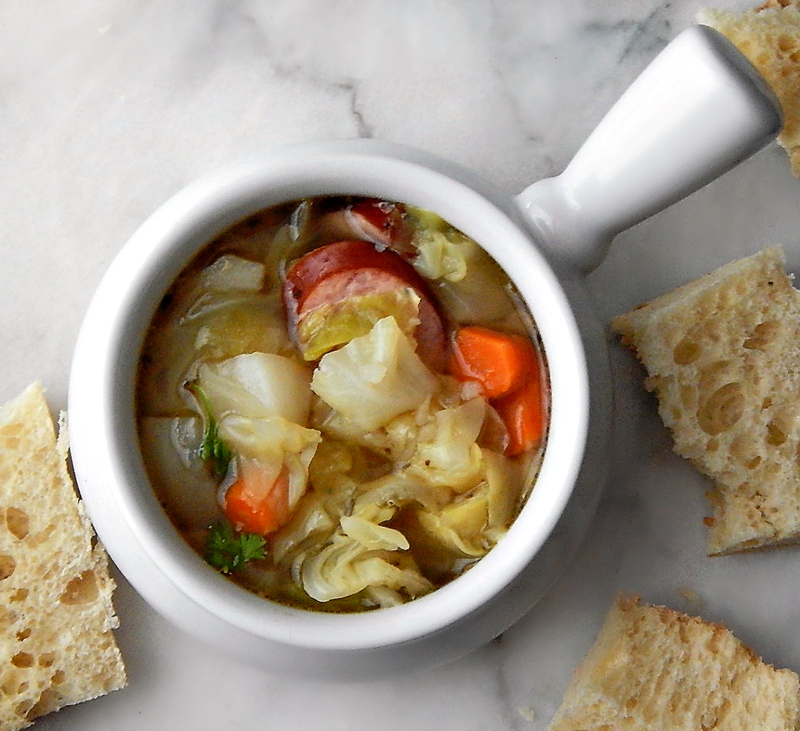 Smoked Sausage and Cabbage Soup, has, of course, Smoked Sausage & Cabbage, but also has a melange of healthy veggies. There’s usually red potatoes, lots of celery & carrots and of course, onions and garlic. All good, hearty and common veggies – but the kicker is that this long-simmered soup (or quick instant pot version) tastes like so much more than the sum of its parts! All those flavors just meld together with the sausage, broth, and spices into a glorious and hearty meal. Ever since I got back from Georgia (New & the Old 2017 covers the trip and the Top Ten most popular recipes in 2017) I’ve been making Smoked Sausage & Cabbage Soup over and over. I can’t seem to get enough. This recipe makes a good-sized pot and freezes well. It’s a great soup to make for a crowd after a winter activity and you can make and stash portions in the freezer if you’re into Food Prep. Sausages can be varied; I’ve always used Smoked or Kielbasa, but my favorite pot of soup this year was made with Smoked Jalapeno Sausage. It was a mistake, really, but a fantastic one! I had it in the freezer and had thawed it out and didn’t notice what kind of sausage it was until I took it out to slice. I would highly recommend that Smoked Jalapeno Sausage for a little non-traditional twist. I’d say to stay away from any of the turkey sausages – they just aren’t great in this soup or in many long cooked recipes. In the past, I’ve usually made Smoked Sausage and Cabbage Soup on the stove top in my big Dutch oven, and sometimes I made it in the slow cooker (I think it’s best on high for 3 to 4 hours but if you’re working all day, it’s still ok done on low for 8 or so.) It wasn’t long, though, before the Instant Pot got involved! Just a few hints for when you’re making Smoked Sausage & Cabbage Soup in the slow cooker or Instant Pot: follow the instructions for the slicing as closely as possible so everything cooks up just right. If the sausage is too thin, the texture will suffer and if the potatoes are too small, they won’t stand up to either the pressure cooking or the long cooking time in the slow cooker. I have just a few shopping tips: Look for any Smoked Sausage on sale and use coupons. You can pick it up for a song, so follow the coupon matching site for your store. Smoked Sausage can stay in the fridge for weeks, freezes well and doesn’t take a lot of room. Stock up, particularly in the fall when it’s usually at a low. The rest of the ingredients are generally always inexpensive. Check Aldi for the best prices if you have one nearby, on the potatoes and carrots. I’ve noticed that sometimes Aldi doesn’t carry cabbage. If you don’t buy at Aldi, generally the larger packages of carrots and potatoes are cheaper. I tend to use any of the oddly shaped ones in things like soup and save the larger, more uniform ones for a side or if potatoes, for baking. Watch the prices on cabbage, by the way, and whether or not the pricing is per head or per pound. If your not careful, you can end up with a pricey head of cabbage. Serve your Smoked Sausage and Cabbage Soup with a good hearty bread, and if you like the dark bread like pumpernickel or rye, you can’t go wrong with either. I like to make my easy, overnight Crusty Bread when I serve soup. In a large Dutch oven, add 1 tablespoon oil and heat to medium-high. Add smoked sausage and cook until golden brown, stirring as needed. Remove and add the onion, using an additional tablespoon oil if needed. Saute until tender. Add garlic and caraway or celery seed and cook for a minute longer, until garlic becomes fragrant. Add the chicken broth, first about a cup or so and scrape the bottom of the pot to deglaze, then add the remainder. If you’d like your soup thick, hold back a cup until soup is finished and add it at the end if you’d like. Add the sausage back in along with celery, carrots, cabbage and potatoes, salt and pepper. Give it a stir. Bring to a boil, then cover partially with a lid and reduce to a brisk simmer. Continue to simmer for 20 to 25 minutes or until potatoes are tender and soup is done to your liking. Add vinegar, then taste and add more salt, pepper, and/or more vinegar if desired. Sprinkle with parsley if using. Add 1 tablespoon oil to Instant Pot and Heat Instant Pot on Saute, High. When hot, add smoked sausage and cook until golden brown, stirring as needed. Add garlic and caraway or celery seed and cook for a minute longer, until garlic becomes fragrant. Add about a cup of the chicken broth and scrape the bottom of the pot to deglaze. Add onion, carrots, celery, and the remainder of the stock (hold back on a cup of the stock if you’d like a thick soup, then add at the end if you’d like) and salt & pepper to taste and stir. Add cabbage and then potatoes, but don’t stir. Sprinkle the vinegar over the potatoes and a little bit more salt if you’d like. Stir, taste and adjust any seasonings, add more vinegar, salt or pepper to taste. Sprinkle with Parsley if using. Note: this soup goes very fast if you chop as you go; start with the sausage, get it going and then continue. The pot will already be hot when it is sealed so won’t take very long to come up to pressure. I’ll be linking up this week at Fiesta Friday #209, hosted this week by Monika @ Everyday Healthy Recipes and Laurena @ Life Diet Health. This entry was posted in Click here for Bargain Meals, Click here for Fabulous Food Posts and tagged Cabbage, Carrots, Chicken Stock, Family Recipe, Instant Pot, kielbasa, Potatoes, Sauerkraut, Sausage, Slow Cooker, smoked sausage, Soup, Vinegar. Bookmark the permalink. This DOES look like comfort food Mollie. I pretty much love any chance to eat sausage! Looks like a perfect meal with a loaf of sturdy bread. How was your weekend?? Stay tucked in at home and did you get out and brave the snow?? hugs! Sorry to reply so late! I have been a HUGE homebody lately. I’m having to force myself out of the house everynow and then! I’m like the groundhog…I come out and want to stay in for the next six weeks, haha~! We just had two days of snow. Ugggh! yikes! no snow like that here. It was raining this evening– ugh. Happy shoveling! (is that possible–happy shoveling??) hugs friend!! No, it’s not, haha!! But it is good excercize? Thanks so much! I do have a recipe for ca ri ga on my blog, or as close as I could get living in rural South Dakota!! I always appreciate a reblog! Have a great day! Your welcome. I always appreciate reading your recipes. They are just like my parents taught me to cook. They inspire me to get back in the kitchen. Hi Chef, sorry for the late reply, and thanks! It’s a classic soup, I think, to so many areas. I never thought to add wine to this soup, but I bet it adds a lot!! I used to run all my nutritional numbers, but I’ve just been to busy. I do have to say that I’ve actually dropped a couple pounds, without even trying, and I think it’s because I’ve been eating so much of this soup! It feels hearty but not heavy and with all that cabbage and other vegetables, I think it’s pretty light. Hi Sheryl! I just had another bowl for dinner, lol!! Nice hearty pot of soup. Perfect for winter eating. It really is! I just can’t seem to get enough of it. It’s hearty but not so bad calorie wise. Thanks much for hosting for us! Vegetarian Polony! Imagine that! We have vegan “butcher” shop in town now I want to check out! Noooo… A vegan butcher? 🤔Oh my! I can’t even begin to imagine that- I’m guessing we’ll have to wait a few more years for that (ding💡.. . Business opportunity). I should have given you their link! They have an amazing story! wow – this is so healthy, rich – My grandparents were preparing it in Poland during the Jewish Holocaust. I know it’s an old recipe! I suppose in a way it’s like the Polish soul food. I know that the whole area practically survived on pea soup, too. Which might be part of the reason it has such a bad rap…. Winner soup recipe! I am a soup fanatic and love cooked cabbage. So I am curious, do you find much of a difference with this soup with stove-top vs. Instant Pot? The first time I did. It took awhile to figure the timing and get the veggies and the sausage done just right. It was really a matter of sizes and timing. Now that I have it down, it’s just as good as the stove-top method.